I wasn’t expecting to think so deeply about the ethics of all-you-can-eat sushi this morning, but here we are. 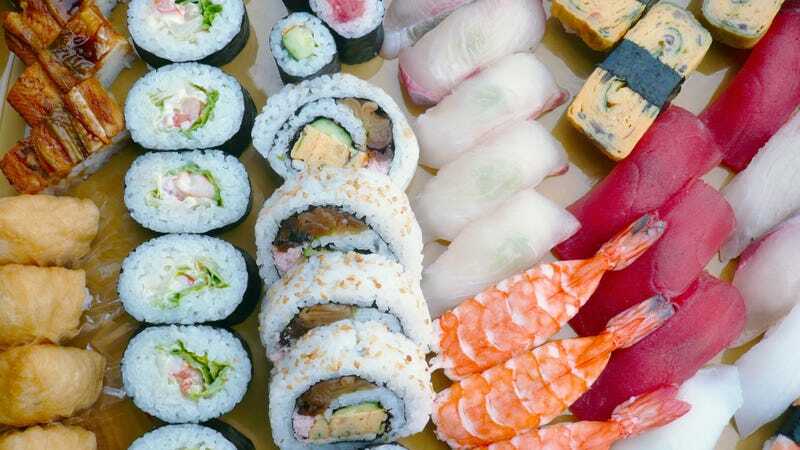 Recent reports that a German triathlete was asked not to return to a restaurant after consuming too much all-you-can-eat sushi have me considering what exactly the moral limits are of an all-you-can-eat promotion. In this case, athlete Jaroslav Bobrowski ordered nearly 100 plates of sushi at a Bavarian restaurant; the owners found his voracious appetite too overwhelming for their business, and they’ve asked him not to return. My question is: Did Mr. Jaroslav Bobrowski do anything “wrong” enough to deserve this ban? On the one hand, I reason, he was merely exercising the gustatory freedom that an all-you-can-eat promotion invites. His appetite is obviously larger than that of the average person (reports indicate he is on a special diet that involves fasting for 12 hours a day), and it evidently takes a large volume of sushi to satiate him. On the other hand, I think, no restaurant expects a customer to take that kind of advantage of an all-you-can-eat promotion. As my editor Kevin Pang put it, offering an all-you-can-eat deal is sort of like selling insurance: The restaurant assumes that enough people will order reasonable portions to offset the few that order slightly more, but Bobrowski’s 100-plate order certainly throws off the calculation. Yes, the sign read “all-you-can-eat,” but was Bobrowski really being fair to the restaurant with his order? Readers, I haven’t yet solved this moral quandary. I expect to devote an inordinate amount of mental effort to its consideration over the coming hours, though, so please leave me some food for thought in the comments—bonus points for referencing your favorite moral philosopher/ethicist and all-you-can-eat Bavarian sushi in the same sentence.